An all-purpose, all-weather patching and flashing cement for asphalt, modified bitumen, metal, EPDM, Hypalon and TPO roofs. 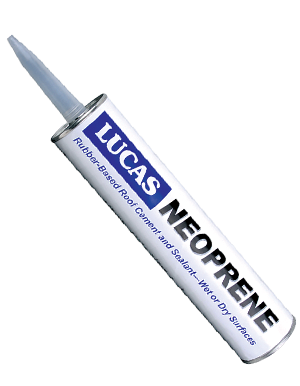 Lucas Neoprene Cement is a premium synthetic rubber based sealant and caulk. Ideal for caulking termination bars, metal flashings and fasteners. It contains no asphalt or other bituminous material. Contains anti-oxidants and light stabilizers for extended life and reinforcing fibers that add strength and durability. Available in black.